Intex Aqua is one of the most popular devices a few years ago. If you are using this phone and want to flash a stock ROM, then this guide is for you. You will get the detailed procedure on Intex Aqua young flash file and flashing procedure with step by step manner. Resolution – 480 x 854 pixels. Intex Aqua Young flash file can fix your phones software problem. Some of the major fixes are listed below. 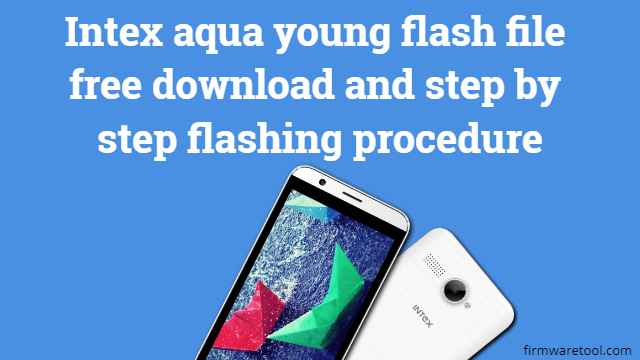 Intex Aqua Young flash file fixes phone hang problem. Flashing stock ROM cleans buggy software/full-screen ads and gives you a smooth performance. Before doing the actual procedure of Intex Aqua Young stock ROM flashing, you need to prepare some things and install drivers for detecting the phone in the computer. Phone’s battery should be above 70%. Install SPD drivers on your computer. Don’t turn off PC while Intex Aqua Young flash file process is in progress. Step1: At first, install SPD drivers from the files provided in above link (pre-requisites point 1). Step2: Now, download the Intex Aqua Young flash file fro the above download link and unzip the file using WinRar/WinZip. Step3: Download SPD upgrade tool from and unzip the files on your computer. For complete installation guide, follow- guide to install SPD upgrade tool on windows. Step4: Now, click on the file named, UpgradeDownload.exe to open the SPD tool. Step5: The SPD tool windows open up on your screen with a new window. Now, turn off and connect your Intex Aqua Young to a computer using the USB cable. Step6: Once the phone is detected by the tool, click on Load Packed button and choose the .pac file from the stock ROM folder. Step7: once the .pac file loading completed, click on start downloading button on SPD tool. Step8: Wait for the flashing process to complete. Step9: Once the process is completed, a passed message with green color will be shown. Now, you can remove the phone, set it and now you can use it normally. Warning - Firmwaretool.com is not responsible for any damage that occurs to your phone during flashing process.